This had been one of the most eagerly awaited events for Small Faces and Humble Pie fans. 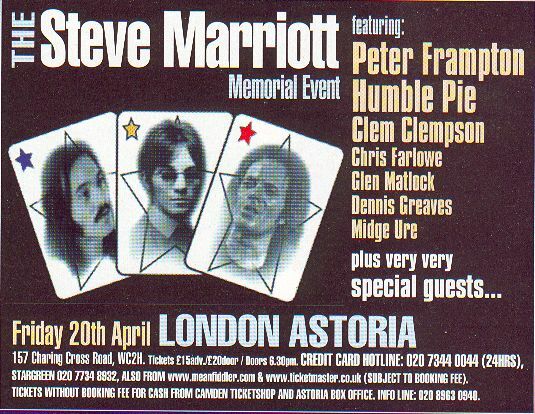 Steve Marriott died ten years ago and many musicians who have great respect for him appeared together for one night only at the Astoria in Central London to pay tribute. The event had long been sold out, even before the final line-up of artists appearing was available. The Astoria was packed to the ceiling. Around 7.30 the event kicked off with Small Faces Convention favourites and Horsham's hottest Small Faces covers band 17 Black storming into Don't Burst My Bubble. the heavy vein continued with Wham Bam Thank You Mam before we were taken back a couple of years with Hey Girl. The set concluded with Rene dedicated to all gropers in the audience (and there were many there). Second on the stage were the inimitable John's Children with the sprightly Andy Ellison on vocals. I'm sure I heard calls for the Radio Stars classic There are No Russians in Russia but I may have been mistaken and it was just me. Next up were the Mods with Sha La La La Lee. They were then joined by Steve Ellis (Love Affair). His voice was a highlight of the evening for many as he started with Understanding and followed with Song of a Baker and a superb Afterglow. The latter, in particular, really showed Steve's voice at its best. The second segment featured the house band with a variety of front singers and backing vocalists. The band included Rick Wills, not only of Foreigner but also Small Faces Mark II where he replaced Ronnie Lane. Nine Below Zero's Dennis Greaves was first on with What'Cha Gonna Do About It, the song he played the first Small Faces Convention. He carried on with some excellent blues guitar, trading licks with Bobby Tench, on Five Long Years and Just a Phone Call Away. Simon Hickling had joined the band by this stage and he moved to centre-stage to take lead vocals on Big Train Stop at Memphis, starting the song with the blues harp intro from Riding on the L&N. The house band then had the stage to themselves as they played the Humble Pie classic Fool for a Pretty Face Bobby Tench on lead vocals. Debbie Bonham then joined the house band on stage along with backing singers for the classic I Can't Stand the Rain. This had been covered by Humble Pie. This was followed by the best point of the evening, in my view, as Debbie sang PP Arnold's (If You Think You're) Groovy (written by Steve and Ronnie). Pity Pat wasn't there to hear it as it was an absolute stormer. Steve's daughter Molly then joined the fray with her band D2M for the Humble Pie song Black Coffee, again with lead vocals by Debbie Bonham. Billy Nicholls, former Immediate stablemate of the Small Faces then moved to lead vocals to lead the crowd in Itchycoo Park. Steve Ellis then came back on stage for My Way of Giving. Rollin' Over was due to be played but was omitted. The Marriott family connection continued with Toby Marriott on guitar and Max Ireland on lead vocals for Thirty Days in the Hole. This concluded the second part of the evening. The third set was the reformed Humble Pie. The band has been playing around the UK recently and has a new studio album due later in the year. However, this was something special. Original members Greg Ridley and Jerry Shirley were joined by "Clem" Clempson alongside the man he replaced Peter Frampton. It was almost as if the past thirty years or so hadn't existed with Frampton fitting in perfectly with the other three. They started with 4 Day Creep followed by Natural Born Bugie, Clempson talking the Marriott vocal role. While the Small Faces songs tended to have the stronger crowd reception during the evening (Humble Pie having been bigger in the US than in the UK), this was truly a great moment with what turned out to be a classic Pie line-up, albeit just for the one night. A cover version followed. Hallelujah I Love Her So had been a feature of the Beatles set back in their Hamburg days but was also a feature of Humble Pie's act. The middle section of the song featured the vocoder and suddenly Frampton came alive again! Humble Pie''s all too brief set could only be finished with one song as Clempson and Frampton's dual guitars lit up the classic I Don't Need No Doctor. Again, a wonderful audience participation number. The only acoustic spot of the evening belonged to Midge Ure who was Michelin man for the night. He played My Mind's Eye and it was a pity that he didn't play more. Maybe Here Come The Nice would have been appropriate here as it was previously covered by Ure's band The Rich Kids. Another stage change for the evening's finale. This was the All Star Band including former Small Faces Kenney Jones and Ian McLagan. As soon as Paul Weller and Noel Gallagher started strumming their acoustic guitars to Become Like You the whole venue erupted. A short pause for Noel to change to his Telecaster while Weller moved to keyboards and then it was into I'm Only Dreaming. It's a known fact that Weller ranks Get Yourself Together as his favourite Small Faces song and, when asking Mac about it, Mac had no recollection of it whatsoever. Therefore, it was good to hear the song in the Bump Band's live set recently and it was included here with Weller back on guitar and Mac on lead vocals. Remember that the Jam used to cover this one too! 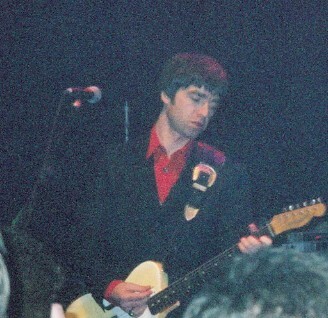 Noel Gallagher has been relatively quiet up to this point and even his guitar seemed to have little sound coming out of it. Nice suit though. He stepped forward to sing lead vocals on Here Come The Nice and it was singalonganoel. We could have guessed what the final two songs would be. The stage started to fill up with backing vocalists as Steve Ellis joined the band for Tin Soldier. Jerry Shirley returned to his drum set along side Kenney Jones so there were two sets of drums for the great song. The number one hit All or Nothing was the final track of the evening with even more backing singers and vocal duties shared between Max Ireland and Paul Weller. The mijit would have loved it.